Council runs a range of community initiatives and events aimed at reducing the amount of waste sent to landfill and promoting the re-use of goods. From discounted compost bins for residents to waste education workshops for schools, there is something for everyone. Our current initiatives and events are listed below. The Compost Revolution is a community initiative in the Eastern Suburbs of Sydney that promotes home composting, growing food locally and connecting with your neighbours. Residents of Woollahra, Waverley and Randwick Councils are eligible for a discounted compost bin or wormfarm through this program. All you need to do is visit the Compost Revolution website and complete the easy composting or worm farming tutorial and quiz to get your hands on a discounted compost bin or worm farm and start turning food scraps into healthy soil for growing food. Composting and worm farming workshops are also held throughout the year between the three Councils. For more information about composting or worm farming, please contact Council on 9391 7000. Single-use plastics, or disposable plastics, are used once before they are thrown away. These items include plastic bags, straws, take-away cutlery and cups, coffee stirrers, soft drink and water bottles and most food packaging. Single-use plastics are petroleum (oil) based which makes them very difficult to recycle and impossible to break down. This means most end up in landfill and eventually in our water supply and oceans, releasing toxic chemicals overtime. The environmental and health impact is devastating. But it’s not too late to help save the planet. We all rely on a healthy ecosystem to survive and we all need to do our bit. The simplest answer is to reduce our overall plastic consumption and make some easy purchasing swaps. Bring a reusable shopping bag with you to the supermarket. By encouraging people to be more aware of their plastic use, we can create a cleaner world for generations to come. Woollahra Council is committed to making a difference. We don’t use single-use plastic bags or supply straws, and we banned plastic water bottles at Council events and meetings in 2009. Our library has also used calico long-use bags for years. In March 2018, Council also resolved that all local festivals and events that Council sponsors, endorses, or participates in, be free of single-use plastic. Join our HarbourCare program to help protect our marine life and keep our harbour clean. Or simply 'Take 3 for the Sea' - take 3 pieces of rubbish from the beach every time they visit. Every little bit helps. We can provide free recycling bins for the collection of plastic/glass bottles and steel/aluminium cans at special event days like fetes, discos, festivals etc. Council's Waste Officer is also available to provide advice on waste management for special events. Workshops include composting, worm farming and recycling for all ages. The information can be tailored to suit the needs of the students based on their curriculum requirements. Other educational activities include conducting classroom waste audits and providing information for school's environmental management plans. We can provide a compost bin and/or worm farm for schools and advice and/or workshops for the students and teachers. Schools and community organisations can order up to 5 compost bins or wormfarms delivered free. Order today through Compost Revolution - the online tutorial is great for kids and teachers alike. Place a separate order for each bin and include your organisation’s name in the address so we know you are not a household. Other recycling opportunities schools could participate include recycling mobile phones and printer cartridges and organising the collection of second hand items like toys, clothes and books for charities and/or not for profit organisations. For more information about sustainable waste management in schools, contact Council's Waste Projects Coordinator on 9391 7966. 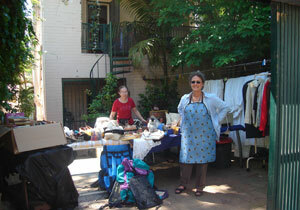 Second Hand Saturday is a popular community event held in the Paddington area that encourages residents to hold garage sales and sell their unwanted, pre-loved goods. It is an excellent opportunity to meet the neighbours and very importantly reduce the amount of waste going to landfill. Why dispose of perfectly re-usable items when you can join in the fun on the day and make a little money while you're at it. The next Second Hand Saturday will be held on Saturday 23 March 2019. A shopper's guide map will be available closer to the date which will help you find participating households and a bit about what they have to offer! Please check this page for future Second Hand Saturday events or contact Pamela Mina by email pamela.mina@woollahra.nsw.gov.au for more information.